Oy vey . . . The title of this post is the name of the course that is giving me fits this quarter. Ugh! I am not a “measurement” type person. Until this course, I was perfectly content to leave the numbers and measurement stuff up to my husband. He’s the scientist. He measures everything, no exceptions. Every book he reads, house we look at, movie we see, etc., Richard will grade. Seldom does anything get an “A” in his book. When asked how he comes up with the grade, Richard will go into great detail about how he figured the numbers and assessed different values to measure an outcome that results in a grade. I kid you not! He offered to tutor me in this course to which I replied, “NO NO NO!” He is a good man but when it comes to discussions about anything of this sort, he just can’t “dumb” himself down to a level that I understand. I am a measurement impaired person. I will probably have to go to the university tutoring site to get help (like today.) Although befuddled and confused by it all, I readily admit the importance of this particular course. In my field of endeavor, assessments, tests and measurements are essential in the process of diagnosing a problem. 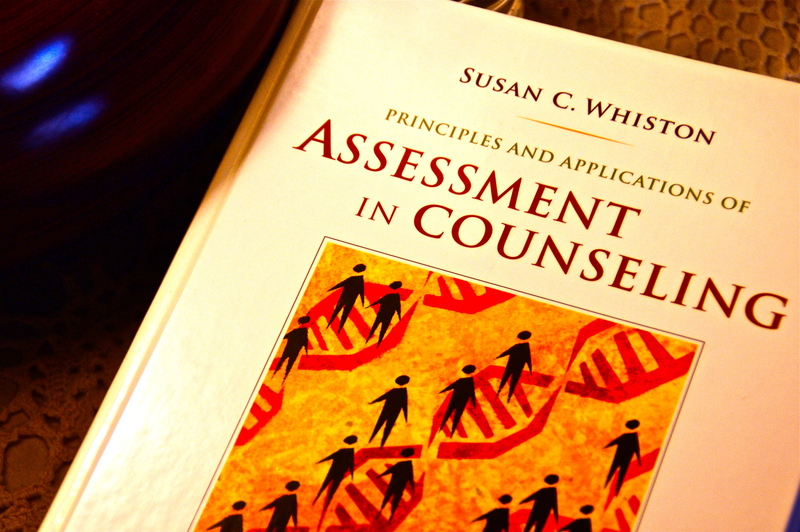 In addition, the ability to accurately and ethically use assessment instruments is addressed in the American Counseling Association Code of Ethics, and is required within the managed health system. Now I could say a LOT about managed care, but that is for another blog. As I was saying about assessments et al., use of the proper tool in the proper way for the proper results benefits future clients’ best interest. So I need to learn this stuff, even if it is turning my brain into a pretzel! So, back to the books I go! Previous A Post for MOM! Bless your heart. I promise that my efforts would be equally frustrating. Hang in there and good luck with the studying this week. Thanks Kathy. When I read this stuff, it is a different language that I have yet to learn! Oh well . . . I will get it . . . eventually! Thanks for stopping by and for the well wishes. Much appreciated. Cecelia, your post brought back the memory of when I took a class called Tests and Measurements for my M.A. in education with specialization in reading. We were required to give an individual IQ test to 14 children and one adult. That was in 1968, so I would think things are different now. I love your “assessment” of Richard. I call my husband “the ever curious Bill.” He cannot pass by any form of work or construction without stopping to observe and, frequently, talk to or ask someone abouut something. Yes, it does sound like our husbands have some commonalities! 🙂 While the course is giving me some gray hairs, I know that I will get it sooner or later. Every counselor has to know this stuff, so I’ll keep plugging away. Thanks for stopping by. I do appreciated it. Have a great day. My grading scale was A= wow, even some words spelled correctly, B=obvious effort here, C+ he did something for a change, D=at least she did not stab anyone today, F=absolute refusal to start or complete any task, truant, asleep. Except breathe and go to the bathroom. On a serious note I did buy into the idea of alternative assessment. If one could not read, he drew the murals. If one could not draw or read she assisted those who could. Naturally this outraged peers and administrators(who by the way made our attendance mandatory at the 3 day alternative assessment workshop) for not failing everyone using the traditional style of lecture, read, test. Given the chance at succeeding at something brought many around to complete traditional tasks. My grades were for effort, not carrying it out to decimal point division by teacher calculations. You sound like a phenomenal teacher. Your students were fortunate to have you. Wish there were more like you. Thanks for stopping by. I feel for you! When I was studying psychology I could not bear the measurements, so I switched from clinical to social psych and got my PhD there …. it was all the anathema of assessing and labeling that got to me. Still I am sure they need you Cecilia, so be brave and give it a go! I know what you mean. I have a real problem with the whole notion of assessments and diagnostics and how they have been used. But to get my license to practice, I have to know this stuff. I liken it to when my husband had to take anatomy. He began his medical studies years ago in another country, but when he got to anatomy he quit — switched to nuclear engineering. Then in recent years he returned to school for another degree, medical physics, and lo and behold, he had to take anatomy. Got a “C” in the course but that was fine with him. It was behind him. I am in a similar boat (although our reasons for the ‘dislikes’ are different). Sooooo, in order to do what I want to do, I’ll “brave” it and “give it a go.” Thanks for stopping by. Wishing you the best of luck with your assesments! Thanks. I need all the good thoughts and luck I can get. This stuff is HARD! Thanks Elizabeth. It is quite a challenge, but I am learning.